Many families across the United State have two working parents in the home and often times don't have the time to clean the house. For many of us...we work 8 to 10 hours a day, rush home to get dinner on the table, run our children to do their activities and bounce back home only to get baths and fall into bed. I mean really, who has time for house cleaning anymore? Certainly not me! It doesn't matter if you are hiring a house cleaning company in Miami or one in New York City...all of these tips apply. 1. 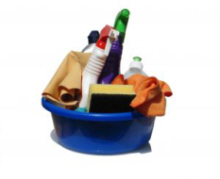 Ask your friends, family members & co-workers if they use a cleaning service and if so, who do they use? Are they pleased with their work? Referrals from others is always a great start on your hunt for the perfect cleaning company. 2. Make a list of all companies you are interested in and call them up to ask questions and to set up evaluation appointments. We suggest that you interview & evaluate at least 3 different companies. 3. When speaking to companies find out if their workers are insured & bonded for the state that you live in. If so, what all does that entail and what is covered should any problems arise. In addition, find out how those workers are trained and what kind of experience will your specific cleaning person have? 4. Narrow down your search to two or three companies and have them each come out on separate weeks to clean your home. Make notes on how well of a job they did, did they arrive on time & leave on time, are their prices fair and other important things that you need to make note of. 5. Finally, realize that most companies make you sign a contract and these contracts can range from a few weeks to several months in length. Make sure that this fits within your budget and is something that you can live with and afford for the length of that contract that you will be signing. For our family, hiring a cleaning company was the right thing to do. I now have more time to spend with my family and doing the things that are important to me.